Legions of nine-to-fivers stare idly at their office monitors, pretending to work in the few short hours before going on holiday. Dysfunctional families assemble for awkward turkey dinners. And, of course, all of the consumer electronics companies ramp up their ad campaigns to lure in the tired, poor and hungry masses of seasonal shoppers. Yet, sadly, by the looks of all the smartphone commercials coming out, it seems advertising companies consider us idiots. Instead of smart, Super Bowl-quality ads, we’re forced to watch ridiculous dreck, often featuring more hype than actual product. Why? Well, most obviously, dreck has been a mainstay of the ad industry since the days of Mad Men. It’s about selling an idea, not a product. Still, with these most recent commercial debuts, we’ve reached a new low. Here are a few of this season’s most egregious offenders. In a certain light, we see what Samsung is trying to do here, and it’s a noble stab at being clever. Take all of the fervor reserved for Apple product releases and poke fun at the adoration, especially when the last iPhone release was so similar to the one previous. On the other hand, the commercial barely even features the actual advertised product, Samsung’s Galaxy S2. Instead, the company is preoccupied with making fun of Apple fans, thus losing the chance to show off the phone’s nifty features. It’s mentioned in passing that the phone has a big screen and is fast. And then the ad spot moves on to more Apple mockery. I’ll admit, the swipe at the Apple-loving barista at the halfway point had me cracking up. Take that, snooty latte-drinking art lovers!) And I love a good dose of company quarreling. But when you’re embroiled in major copyright infringement litigation with the company you’re mocking — especially when that litigation focuses on how often you seem to be ripping said company off — it’s hard to take your jabs seriously, Samsung. Oh, and by the way — nice new white Galaxy S2 release. The more I see it in practice, the more a Siri-reliant world frightens me. Is it not an exercise in futility to ask if it’ll be chilly in San Francisco? When you’re sitting and staring at cars in front of you, is it truly necessary to ask Siri if there’s traffic in this area? And, honestly, if you really need to ask how many cups are in 12 ounces, you probably shouldn’t be baking in the first place. Or be allowed near an open flame. Don’t get me wrong: Half the charm of Siri is found in the novelty of asking the virtual assistant questions. But after the novelty wears off, will we continue to ask her easily answerable questions? Will the cutesiness of a pocket-portable version of Google wear us down to the point where we cease pondering, and start Siri-ing? I know it’s a tablet and not a smartphone, but Amazon’s latest Kindle spot bugs me. It doesn’t matter that the commercial is aiming to depict that nice feeling you get upon receiving a surprise gift in time for Christmas. No, the real takeaway here is that any mailman who leaves a package filled with relatively expensive electronics equipment on the front porch of an urban Brownstone deserves to be fired. No way in hell that package sits there for more than 20 minutes without getting swiped. And, just how did our protagonist jump online so quickly? Does her Wi-Fi reach her doorstep? Does she even know her password string by memory? Because, no, the Kindle doesn’t come with 3G support for internet-nearly-everywhere connectivity. Oh, wait, it’s a flawed, laggy Kindle Fire. No one will be stealing that. This commercial is almost too stupid for words. A full 51 seconds of the ad is concentrated on a low-budget version of some Michael Bay flick, followed by nine seconds of video of the actual phone for sale. And, of course, the phone is held up on all four of its sides with spears. Because it’s the Razr. Get it? You’d think the company would have learned from its past horrible ads for Droid products. 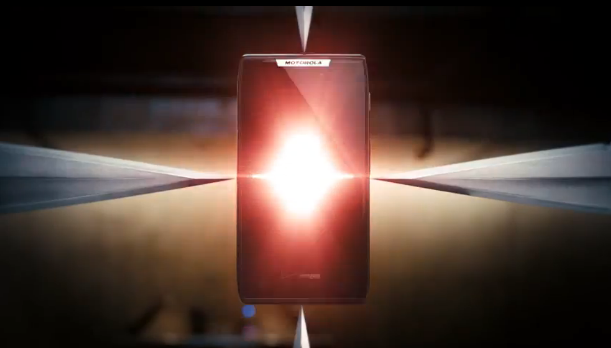 When the Droid Bionic came out, the first ad featured 60 seconds of a Lara Croft-meets-Blade Runner face off. Zero phone screen time. Seriously, Motorola, no matter what sort of mini-saga you play out on screen, I’m not going to be inspired to buy your phone unless you actually tell me what the product is.